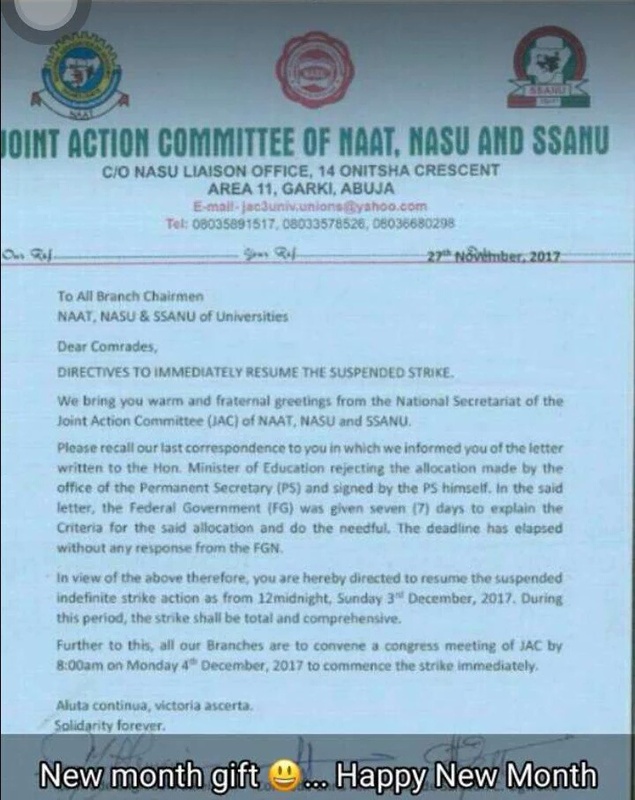 The non-academic staff members of the University comprising of SSANU, NASU and NAAT under the aegis of the Joint Action Committee resumed their suspended nationwide strike across the federal Universities in Nigeria on the 3rd of December 2017. The strike which is as a result of the non-academic staffs not satisfied with the sharing formula of the funds released to both the academic staff and non-academic staff of the university has been on for more than two months with no end in sight. 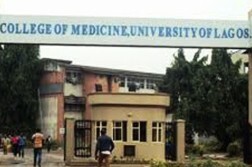 While most universities have resumed despite the industrial strike action embarked upon by the non-academic staffs, the academic staffs who are satisfied with the sharing formula, having been at the receiving end of a larger percentage of the funds have not only resumed work, but are also taking up duties and roles of the non-academic staffs that are necessary for the smooth running of the University. However, the strike by the non-academic staff is still having an adverse effect on the smooth running of the University. Allocation of hostels: Recently over this week – here in idi-araba , our hostel application and allocation process, has been turbulent and scattered (although a process long overdue, as we have been in the same room from 2016) The hostel managements (private) justified their misconducts, misbehaviors and mismatch i.e. 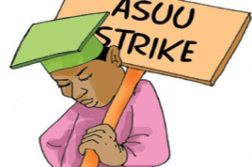 tampering with the DSAs room and occupant list – to the fact that NASU is on strike. This then puts us at the mercy of the porters who do not hesitate to exercise their new found power at the slightest opportunity. Locking of classes: The strike has also affected the opening of classes and departments at the idi-araba campus, according to one of our correspondence. On the 29th of December 2017, the departmental gates were locked and we were supposed to have exams by 9am… They refused to open the gates until some “take no nonsense professors” showed up around 10-11am, after many doctors had tried to persuade them (NASU) to open the gates. This strike has become a show of power between the academic and non-academic staffs as one claims the other cannot do without them while the other claims the others absence would not affect the smooth running of the school. Libraries: The effect of the strike on the Akoka campus is majorly felt through the libraries. At the beginning of the semester the libraries were not open i.e. the main library and the education library, but later, the main library was opened majorly for the registration of freshers.During this period, students could make use of it between 8am-4pm. However, students did not have access to books in the reserve and other materials that can only be gotten at the library. Power: According to a report by one of our correspondence, on the 31st of January NASU officials shut down Unilag Power Station, NASU Unilag chapter members as at time of the report, were all over the power station following the deadlock they were having with the federal government concerning their ongoing nationwide strike. They Shut down the water tower and locked the control room. Access to documents: Another effect of this strike is on administrative work ,as students have not been able to get important documents from offices. For instance letters of recommendations, transcripts, registration, rectification of results etc. all of which have deadlines, depriving the students of those opportunities they would otherwise have gotten if they had meet the deadlines. The Press Club, UNILAG commends the school management on handling the issue of electricity and water on campus, this was an area that was assumed would cripple the university but the management has been able to handle it effectively. The Press Club, UNILAG also seize this medium to sympathise with the non-academic staff unions in their struggle recognizing the fact that industrial actions is within the confines of their legal rights. Having established this, we will also like to remind them that actions such as flogging and locking the school gates which has since been prohibited by the school management should be discontinued. Furthermore, we will also like to state unequivocally, that the recent threat to disrupt the forthcoming convocation activities is not within the legal confines of their industrial actions and as such desist from such threats and plans. While the students are already bearing the brunt of their industrial action, a direct confrontation with the students by disrupting the convocation will not meet their demands but compound their issues. 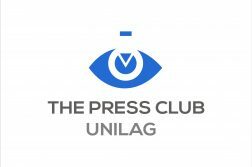 The Press Club, UNILAG recognizes that the University is not in its whole without the non-academic staffs. It is on this note that we hereby appeal to all appropriate authorities including the University management to intervene by drawing the attention of the federal government to their plight and reach a compromise with them.